The correlation between the angiographically determined grade of a coronary stenosis and its functional severity is often poor . A better test for the significance of a coronary lesion is the invasive measurement of coronary flow reserve (CFR) . 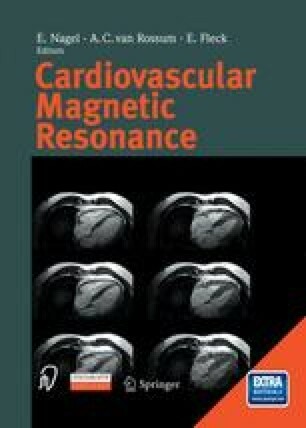 CFR can be determined by using an intracoronary Doppler-flow wire and quantifying the ratio of maximal achievable coronary flow under pharmacological vasodilation and baseline flow [12, 45]. Assessment of the flow reserve is necessary because baseline coronary flow remains constant for moderate to severe grades of stenosis due to partial consumption of the flow reserve at rest. Thus, assessing coronary resting flow is insufficient to determine the functional severity of a coronary stenosis. However, maximal achievable coronary flow and therefore coronary flow reserve are already decreased with a mild to moderate stenosis of approximately 40% . Fig. 20.1 demonstrates the principal of assessing flow with increasing grade of coronary stenosis.